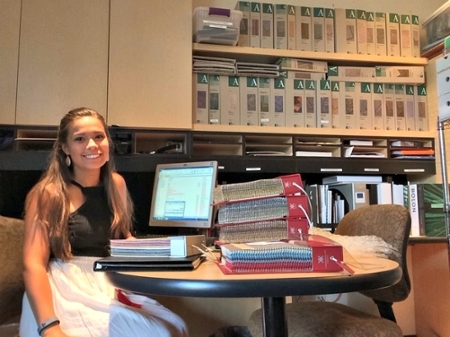 Why did you apply to intern at Marc-Michaels Interior Design? I applied to intern at Marc-Michaels out of a love for their exquisite work and an interest in their specific design process and specialization in luxury residences—not to mention their highly regarded reputation as one of the Top 100 Interior Design Firms in the World. Every day is different as an intern. I have a hand in multiple different projects as I’m becoming more familiar with the wide variety of materials, vendors, and processes used within this industry. The most challenging aspect of the internship is not being able to do everything at once. Everything I end up working on requires attention, and sometimes I wish I could just do more than I actually can. I am most excited about the people I work with and the high-end projects that I get to see come alive. I am surprised by the culture of the workplace. I didn’t know what to expect but I was thoroughly impressed to see how much everyone at the firm cares about helping me learn. Describe the most meaningful experience you’ve had as an intern. The most meaningful experience has been growing in genuine relationships with the people who work there. This internship has not only given me a clearer picture of what I might expect within the industry of my choice, but it also has sharpened my character and servant-leadership skills. I had the mentality to take on anything given to me for the whole summer and through this service I was truly able to earn respect and graciousness from others at the firm. Working for such a highly regarded residential design firm was a blessing and an experience unlike any other, where I got to see the inner workings of a successful and renowned business.